There are apps that live only on our iPhones and others that are best suited for the iPad. Most of our photo taking apps are more often used on our iPhones, while we do editing more on the iPad… big screen and our big fingers! The developers for Top Camera want to convince us to move some of our serious photo taking to our iPads. The app does offer a lot of features to edit photos both with touch up and filtering. The strength of the app though is all the things you can do with the actual process of photographing. There are enough features to consider for every photo taken, Top Camera becomes the app you launch to actually take you photos with rather than using the built-in camera app. All of the actions are available on the screen to quickly choose and adjust. Most often for us is the automated real HDR where Top Camera does the multi shots for us. Not to lessen those amongst our team that live for the streaks of light from the cars driving by through the Slow Shutter option. FOLDERS – organize your photos into folders. You can create new folder, delete, reorder, export, change names and move photos from one folder to another. 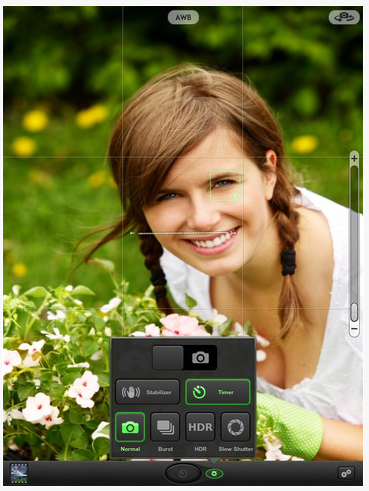 Virtual Horizon – Provides a visual leveling bar to keep your images straight. The Top Camera app does want to be everything for your and your photos, so photo management is a bit different in that all images are saved and categorized within the app. If you don’t take the action to save the photo off to your iPad’s photo library and happen to delete it within Top Camera, it is gone. On the other side of the argument, photo taking and touching them up is a lot less back-n-forth as everything can be done within one app cutting down the closing, launching, searching of photos, Top Camera has everything available in on spot to get your photos just right to share.